I sure hope you and yours had a great holiday season with just enough food and visitors to make life feel jolly, some quiet moments that made it feel special, and, of course, that you remained safe on the roads! My goal is to help you start the brand new year with a “bang” by offering you a fantastic short story. For those of you who don’t know this yet, the “stars” of my books are always cars. Then there’s my alter-ego “Charlie” who gets IN the car and gets himself into trouble . . . I mean, adventures! 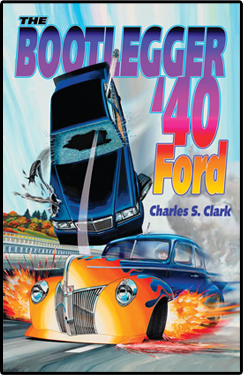 He sure had one serious adventure after another in Book One, The Bootlegger ‘40 Ford. But, whether or not you’ve read my first novel, I know you’re gonna love today’s special short story. For one thing, it’s short! So you won’t have to invest too much of your time. Just enough to get “hooked,” I hope. The short story is about a car PART. I know, you’re shaking your head. But I promise it WILL make sense. After all, if you don’t have the parts, you can’t have the car. So this is a back-story Prequel that slides in right before the novel, giving you a chance to rev your engine before you take off on the main adventure. Each of my publication dates is timed to coordinate with a special car event. Makes sense, right? The LA Roadster show starting January 27 at the Fairplex in Pomona, CA is important because of the award of the AMBR (America’s Most Beautiful Roadster) trophy. This award has both national and International significance. It’s a nine foot trophy that is awarded for superb workmanship and beautiful styling of the iconic roadsters of the 1930s. Know anyone like that? When you look deeply into hot rodding, you’ll always find some of these unusual folks. We follow my character through some of his earlier, failed experiments, and peek over his shoulder as he begins to realize he can create his own solution to the problem. You’ll fall in love with this guy as much as I did. And then when you see what his work leads to . . . well, it’s a real life adventure! Well, it’s all real, except for the parts I made up. This short story will be available soon in print, eBook and audio formats. You can also continue reading what happens next by getting your copy of The Bootlegger ’40 Ford in three formats! And the AUDIO BOOK is available from Audible! Okay, that’s all the news for now. If you’re driving somewhere during January when it can be icy in many parts of the country, remember to be SAFE on the roads, and remind yourself of your New Year’s Resolutions when the traffic gets heavy. This article was published in Bootlegger Book Blog, Titanium Camshaft and tagged 40 Ford, hot rodders, hot rods, Titanium Camshaft.